I’m sure you mean “H-up” to be surrounded by angled brackets. So, “&lt:” should be “<” instead. Why not just use left/up/right/down arrow keys? In my opinion they’re too far away off of the “home row” on a keyboard to be useful and convenient for code navigation – so I use Ctrl+N/P/F/B to navigate code, and arrow keys to change windows. You need ace-window (get it from MELPA). Then map it to C-x o and your window manipulation problems are solved. With the universal argument, it will swap window contents. With two universal arguments it will delete a window. I’ve tried all the solutions you talk about and others and believe me, ace-window is what you want. C-x o is a bad default, switching windows is just too common an operation. It’s non-standard but I’ve mapped C-; to previous-multframe-window and C-‘ to next-multiframe-window. I’d be curious to hear others solutions. 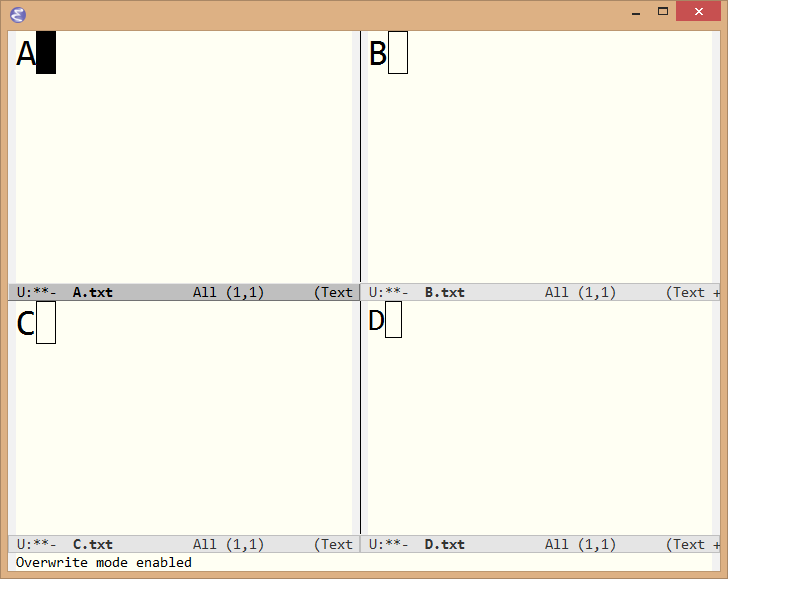 Note that modern emacs also supports indivdual frames, in addition to windows. An emacs window is a subdivision of frame; just as “C-x 2” will create a new window in the current frame, “C-x 5 2” will create a brand new frame. In my emacs setup, I have assigned other-window to F5 and other-frame to F6. I find that it provides a good conceptual split to be able to decide to move inside or between frames. Obviously, frames are only relevant in a windowing system. @jcs: You’re right. ace-window is the way to go. Thanks. VJ commented that C-x o isn’t the best binding for ace-window and I agree. Before 24.4 I had it bound to <f11>, which worked really well but 24.4 grabbed that binding for full screen so I dropped back to C-x 0. Some function key or other easy sequence is probably the way to go. ace-window solves so many problems that the key sequence hardly matters. I was digging this last week. try ‘setxkbmap -option altwin:hyper_win’ or ‘setxkbmap -option altwin:alt_super_win’. The first one would map both LWIN and RWIN to Hyper, and the latter would map LWIN and MENU to Super, RWIN to Alt_R. Refer /usr/share/X11/xkb/symbols/altwin for details. But I failed to map LWIN to Super, RWIN to Hyper. Tried to modify file /usr/share/X11/xkb/symbols/altwin, but setxkbmap won’t use it. It seems it reads options from some other places. Anyone helps? Here is what I use under X11 to set up advanced modifier keys. I save it to a file and load it with a command like: “xmodmap “. It uses direct key codes, which I find to be most reliable but also means you need to adjust for your specific keyboard and language (use ‘xev’ to discover precise codes). Also note that some window managers like to reserve certain keybindings for it self (for instance ALT or Menu key combinations), some can be disabled but not necessarily all. Exclamation point starts a comment. Oh my goodness, ace-window is so much better. Thanks for the heads-up, jcs and Dr. Cook.